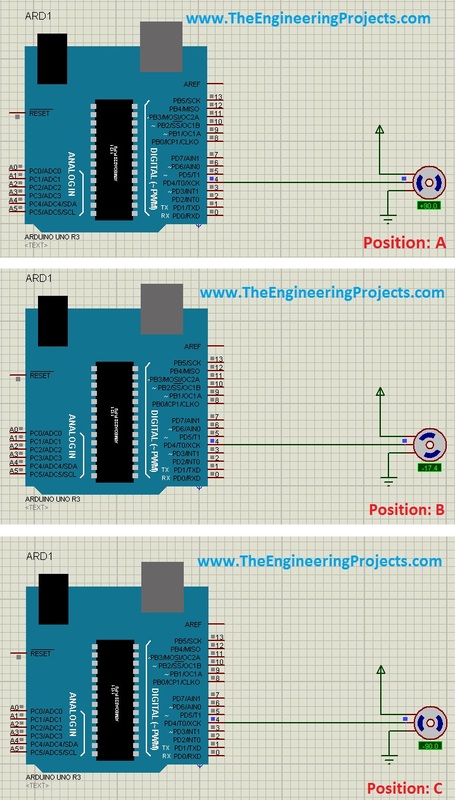 A complete step by step tutorial on How to Control Servo Motor with Arduino in Proteus ISIS. Hello friends, hope you all are fine and having fun with your lives. Today’s post is about Controlling of Servo Motor with Arduino in Proteus ISIS. Servo Motor is quite a common motor used in engineering projects. It is normally used where precise circular motion is required. The reason is because we can move the servo motor at any desired angle which is not possible in case of other motors. For example, I want to move my antenna at precise angle of 90 degree then in that case I can use DC Motor but in DC motor I have to use encoder if I want to move it precisely at 90 degrees. Or I can also move DC motor with delays but in that case it can stop at 85 of 95 something which is not very recise. So, in such cases instead of using DC motor, I will prefer Servo Motor. You should have a look at How to Control Servo Motor in Proteus. First of all, open your Proteus ISIS software and design the below simple circuit. Servo Motor has three pins, one of them goes to Vcc, other one to GND while the center pin is the controlling pin and goes to any digital pin of Arduino. I have connected the control pin to pin # 4 of my Arduino. Next thing we need to do is to design the code for Arduino. So, open your Arduino software and copy paste the below code in it. Now compile this code and get your hex file. Its the same code as given in the Servo folder of Examples in Arduino software. 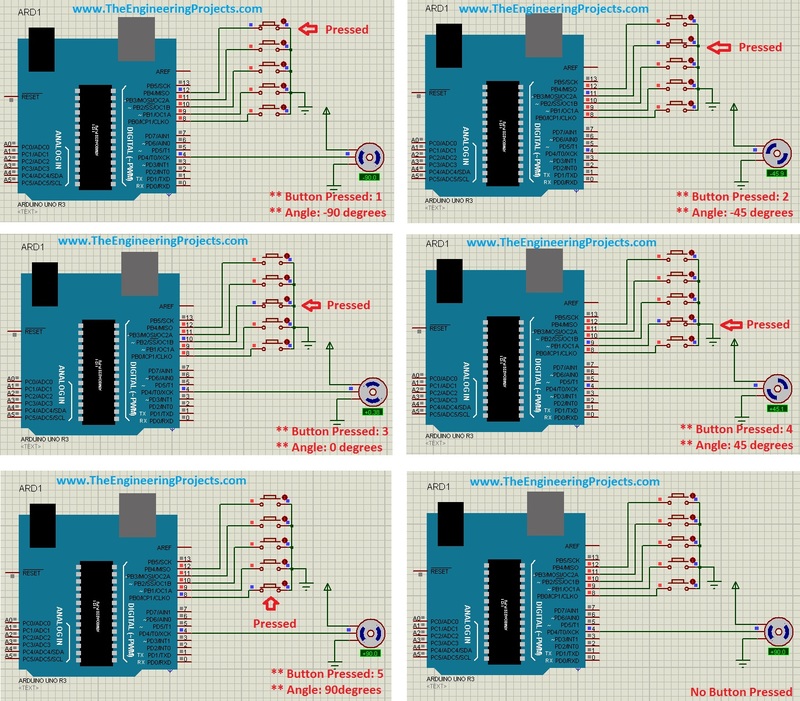 Upload your hex file in your Proteus Arduino board. 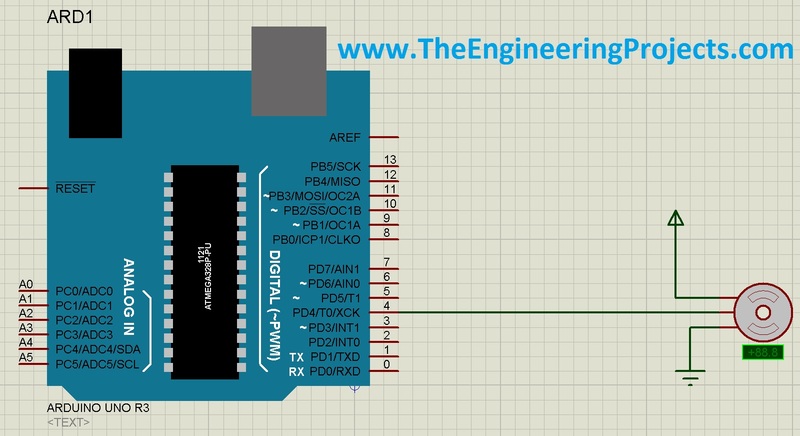 You should read How to get Hex File from Arduino, if you don’t know already. Now when you start it , first of all it will show the Position A in above figure then will move anticlockwise and pass the position B and finally will stop at Position C and then it will move clockwise and comes back to Position A after passing Position B. 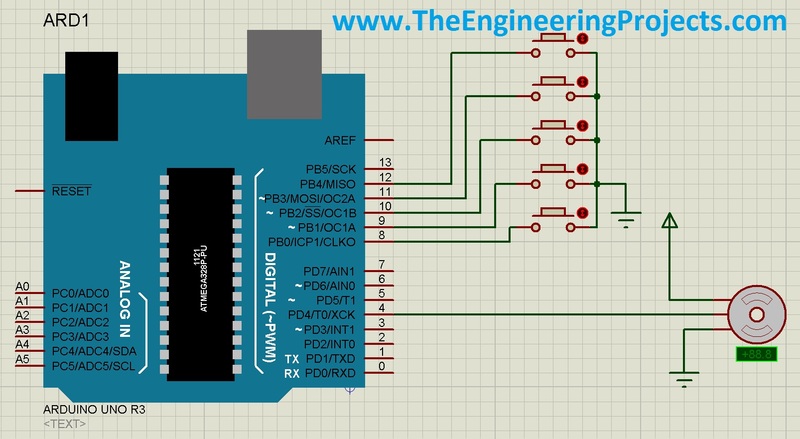 In this way it will keep on moving between Position A and C.
Till now we have seen a simple control of Servo Motor with Arduino in Prtoteus ISIS, now lets have a look at a bit complex control of servo motor with Arduino. In the previous section, we have seen a simple Control of Servo Motor with Arduino in which we simply moved Servo motor from 90 degrees to -90 degrees and vice versa. Now I am gonna control Servo motor using five push buttons and each push button will move the Servo motor to a precise angle. I have added five buttons with Arduino and now with these five buttons I will move Servo motor to 90 , 45 , 0 , -45 and -90 degrees. So, each buttons has its precise angle and it will move the motor to that angle only. Upload this hex file to your Arduino board in Proteus and run the simulation. The above figure is quite self explanatory but still I explain a little. In the first figure I pressed the first button and the motor moved to -90 degrees. In the second figure I pressed the second button and the motor moved to -45 degrees. In the third figure I pressed the third button and the motor moved to 0 degrees. In the fourth figure I pressed the fourth button and the motor moved to 45 degrees. In the fifth figure I pressed the fifth button and the motor moved to 90 degrees. In the sixth figure all buttons are unpressed and the motor remained at the last position. You are getting this error in Arduino or Proteus ??? You must be doing some mistake while designing the simulation. Make sure you uploaded the hex file correctly. sir for simulation arduino is necessary?or we can do it through only software? Yes you can work only using software. What’s the meaning of myservo.write(180),(117),(93),(68),(3)? #include <Servo.h> // what is this? my servo motor automatically starts even before pressing the push button ??????? I think you should check it again if its working properly ,because i face the same issue at end i come to know that the motor was not working properly ,its controlling function was damaged.